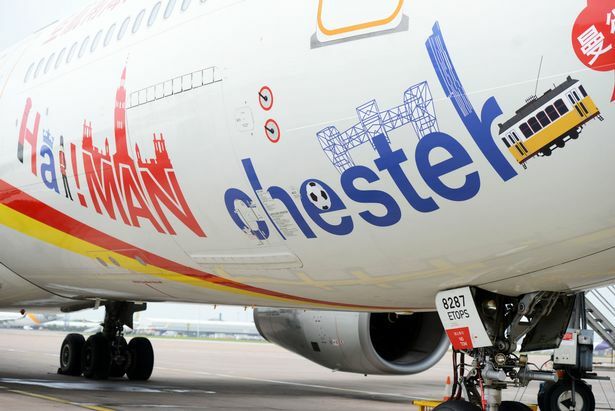 Direct flights between Beijing and Manchester are taking off from Manchester Airport via carrier Hainan Airlines. The connection, launched in June, has since funneled 40,000 passengers to the north west of England. HNA Group, the parent of Hainan Airlines, is behind the newly-forged connection in a bid for international expansion. As Manchester is home to the third biggest China Town in Europe and hosts 105,000 students across four universities, visiting families and friends have an easier go of it. The direct flight is being advertised throughout Britain in Chinese communities and, more immediately, to the Manchester Airport's catchment area which spans Scotland, the West Midlands, North Wales, Merseyside, and Yorkshire. Manchester Airport has begun web-chatting in Mandarin to its Chinese clientele. The social platforms Weibo and WeChat, the equivalent of Twitter and Whatsapp, offer a unique method of communication between clientele and flight operators. 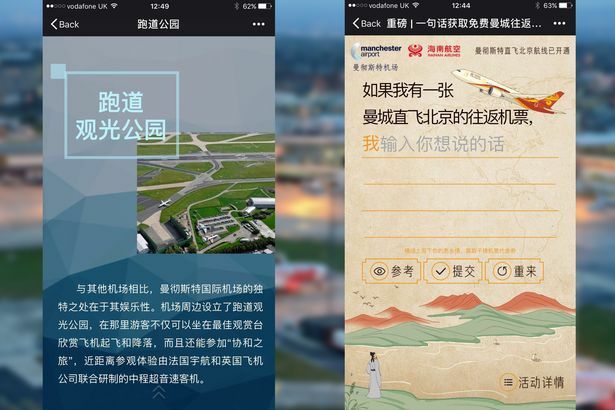 The language barrier has been overcome thanks to the unbelievable power of social media and Chinese digital agency Red Lantern, who are responsible for operating and developing Manchester Airport's profiles. In addition to bridging any language and cultural barriers, Red Lantern is orchestrating initiatives to attract potential customers, for example, a poetry competition with a £1,000 flight voucher prize for Hainan Airlines. 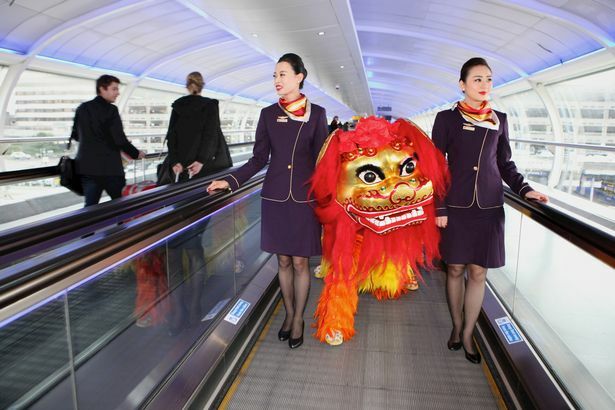 Founder of Red Lantern Lewis Hannam said, "The direct flights between Manchester and Beijing are a significant boost to trade between the two countries, and it's great that Manchester Airport is doing all it can to be the UK's most China-friendly airport." Manchester Airport has an interactive WeChat account which provides visitors with on-demand information including airport services, an airport map, travel information, eating options, language help, free Wi-Fi, and duty-free tax information. Both the Weibo and WeChat accounts have tourist information accessible in Mandarin and Manchester-related video content featuring local Chinese students. In the videos, students briefly discuss Manchester and highlight some key places to visit. Patrick Alexander, head of marketing at Manchester Airport, said to Manchester Evening News, "What better way to speak to a core demographic and our new passenger base than adopting the channels they know and love. Not only can we provide them with relevant airport and airline information, but by using their channels, in their native Mandarin, we can give added value and a better, more targeted, customer service." Those wishing to catch a flight to Beijing will find Hainan Airlines flying four times a week from Manchester. Facebook 'Fake News': A Scapegoat?